RARE FIND! Zoning allows 2 houses. 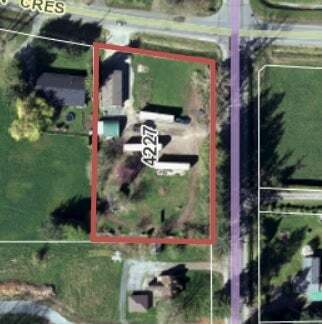 Parklike 0.97 acre fenced & gated corner property. BONUS - on CITY SEWER. Deep drilled well. Potential to strata into 2 titles. 23x21 wired workshop with 200 amp service. Two driveways already in. One on 248 Street and 2nd driveway on Robertson Crescent. To one side of the property with own driveway on Robertson Crescent is a very nice, newer 2012, 3 bedroom, 2 bathroom double wide with open plan & vaulted ceiling. Open kitchen, living and dining room. Master with full ensuite. Live in the double wide while you build or sell off the double wide and build 2 new homes. Great location for home business and to build your dream home. Floor Area 1,104 Sq. Ft. Lot Size 42253 Sq. Ft.